Kelly has experience working with athletes of all levels, including high school, collegiate, and professional. In addition to her interest in orthopedic injuries and post-surgical rehabilitation, Kelly enjoys working part-time in the home-health pediatric setting. 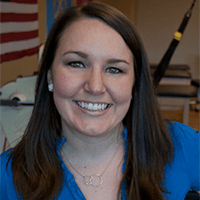 Kelly provides high quality care by integrating manual therapy techniques, patient education, and patient specific exercises prescription in order to help patients maximize their potential. In her free time, Kelly enjoys hanging out with friends and family, working out, playing golf, and cheering for the St. Louis Blues.